You might understand that standing and sitting with good posture is something you should strive to do…but do you know why? Are you sitting taller as you’re reading this? I certainly am! 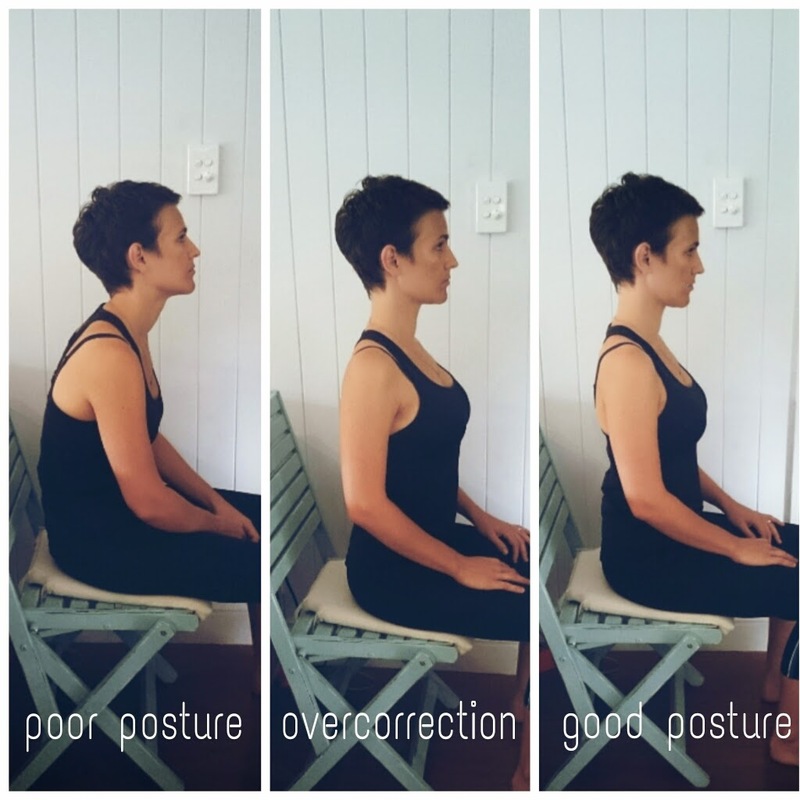 What exactly is ‘good’ posture? Good posture is the standing/sitting/walking/lying position that puts the least amount of strain on your muscles, ligaments, joints and bones. You recognise it when you see it, but you might not know how to correct your own. Many people think good posture involves pulling your shoulders back, sticking your chest out and sitting/standing tall. This often results in overcorrection and is one of the most common mistakes I see. Good posture is a lot more subtle that people think. Good posture: There is a small inward curve in the lower back and neck, a small outward curve in the mid back and chin is gently tucked in. But why is it so hard to hold good posture? To start with, you might be overcorrecting. Not only does this mean your muscles work harder than they have to but it can also lead to more pain. Even if you are doing it properly (and trust me, most people aren’t), this is probably a new position for your body and like any new exercise, it takes time to build up the endurance required to hold it for long periods. How am I meant to stand/sit with good posture all day? You’re not! Our bodies aren’t designed to hold any position (even good ones) for long periods of time. The key is to mix it up! Get up from your chair, don’t stand all day, get down on the floor and do a few stretches! When you absolutely have to hold any position for long periods of time, the best think you can do is make sure you’re properly supported. This is where good pillows, good shoes and a good chair can help. If you are set up in a way that supports good posture, it is much easier to sustain. Check out my top tips for your best desk posture here! My mum/grandmother has a hunchback – does this mean I will have one? Believe it or not, this is probably the most common question I am asked! A hunchback (kyphosis) in older women is often a sign of osteoporosis. Whilst there is a genetic component to both osteoporosis and kyphosis, there are other factors that are within your control.You can prevent the progression of kyphosis by staying active, working on maintaining your bone density and improving your posture. What steps can I take to improve my posture? Know where you are starting from. What is wrong with your posture? Do you have a sway back / rounded shoulders / poked chin? Are you aware of your poor posture or do you think it is great? Bring your attention to your posture more often. Start to take notice when you see photos of yourself or catch a glimpse of your reflection in the shop window. Get some help! A good physiotherapist can assess where you are starting from and determine if there are any muscle strength / flexibility or joint issues that might be contributing to your posture. Often just making a few small changes to your support system (shoes / chair / bed), improving your awareness and doing a few simple stretches can make a BIG difference.